God is at work! We want to be a part of a movement of mission and discipleship on the First Coast. We want to see revival in churches and renewal across our community. That’s bigger than any of us who are involved in this new church, but we believe it is not too big a thing for God. We believe God delights to do extraordinary things through ordinary people – and we feel pretty ordinary. So we are praying for God to establish healthy mssional communities and are inviting people into discipleship. We believe our part in this is to focus on three things. 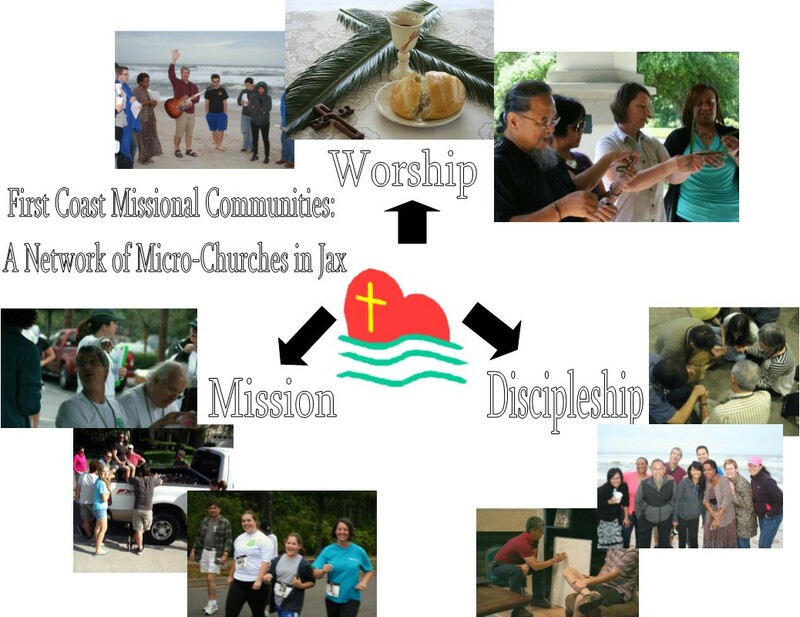 We work at launching healthy missional communities (aka micro-churches or MCs). We equip people to be disciples who make disciples. 1) We work at launching healthy missional communities. We believe that healthy missional communities focused on discipleship and mission under healthy leadership will naturally grow AND multiply as they seek to follow Jesus Christ together. 3) We gather for worship to celebrate what God is doing. By doing so, we find inspiration and encouragement. We believe that coming together reminds us that our church is bigger than any one of us or than any one group – and it gives us an opportunity to learn from one another and share our stories of God at work. Our worship services celebrate God! Of course, none of this will happen unless God moves. We can do our part, but we believe very firmly that we are involved in something only God can bring about. So we pray a lot! And we will glorify Him as He does! Thanks for visiting. Pray for us! We are a church of missional communities for a movement of mission and discipleship.